Have you ever been to a proper high tea? The kind with mini sandwiches, bite-sized desserts, and of course – tea? I finally had the chance to go with my mom over the holidays and it was magical. We were presented with an array of premium teas in a gorgeous wooden box upon arrival, followed by a tower of treats placed on our table. We chatted while we slowly savored each perfectly prepared bite and sipped our tea. Everything tasted delicious and the time spent with my mom will be forever cherished. With Mother’s Day just around the corner, I can’t think of a better way to celebrate than with something reminiscent of that memorable day. 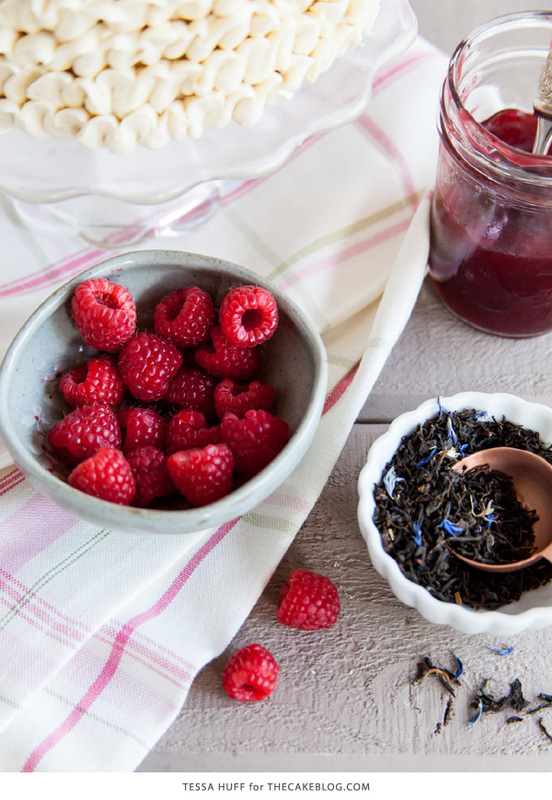 If you can’t take mom out to a high tea this year, why not make a tea-inspired treat of your own? 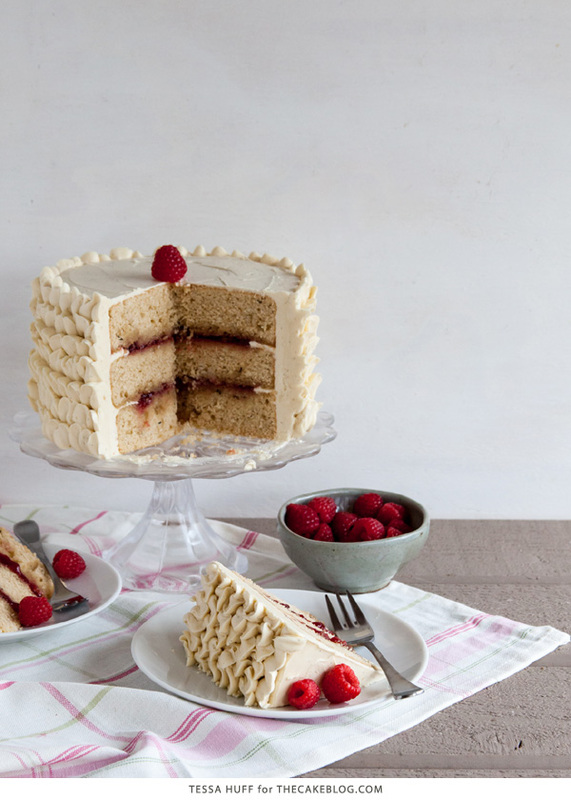 This Raspberry Earl Grey cake just might the next best thing. 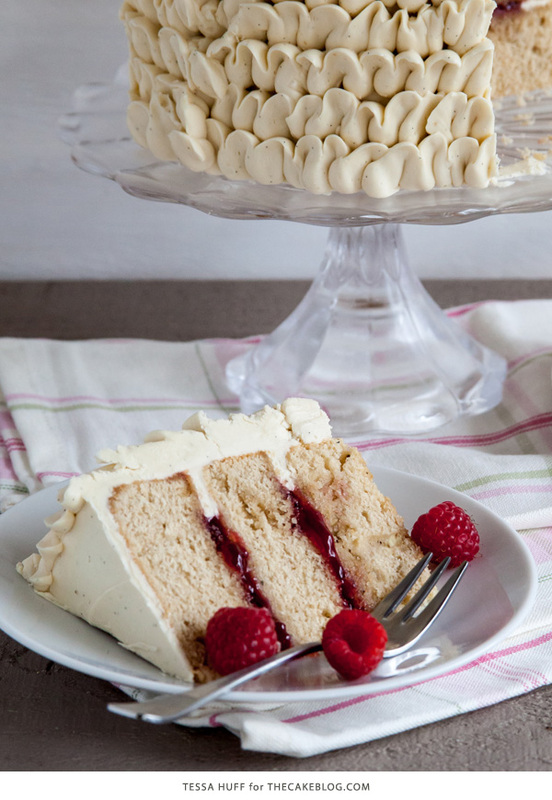 The infused butter cake is paired with a touch of sweet raspberry and vanilla-specked buttercream. Unlike a heavy chocolate dessert or a cake drenched in caramel, the flavors are bold yet still light and delicate. The perfect ending to a Mother’s Day brunch or afternoon tea. Infusing desserts with teas and herbs is a unique and easy way to add flavor and make new creations. I’ve steeped the Earl Grey in milk and even added some finely ground tea to flavor this vanilla cake. More tea was added to create a concentrated Earl Grey simple syrup used to flavor and moistened the cake and create the buttercream. For the filling, I used simple raspberry preserves to balance out the robust, slightly citrus black tea and to add a pop of tartness to each bite. 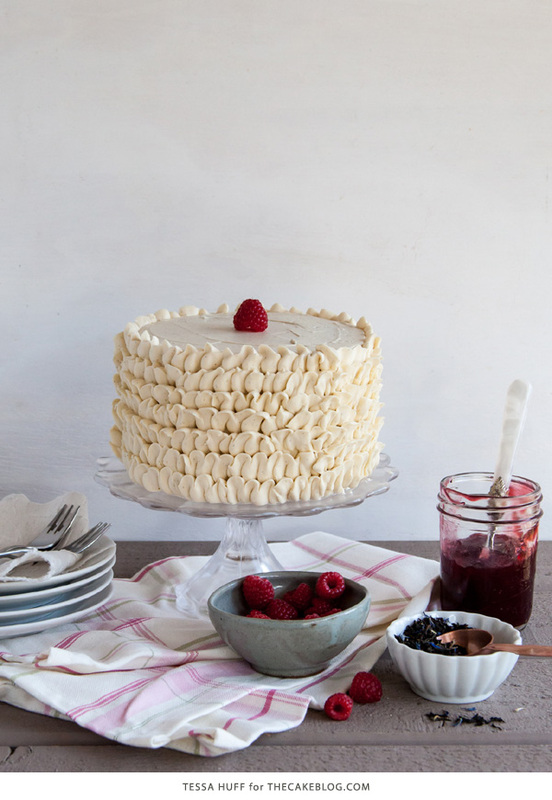 Since the cake is not overly sweet, feel free to pipe on some extra buttercream – like delicate ruffles or rosettes. Serve with fresh raspberries, if desired! Preheat oven to 350 degrees. Prepare three 6-inch cake pans with butter and flour. Set aside. Place the milk in a medium saucepan over medium heat. Gently bring to a slight boil and add in the 1 1/2 tablespoons tea. Reduce heat and let simmer for about 10 minutes. Remove from the heat and continue to steep for an additional 5-10 minutes then strain. Set infused milk aside. Meanwhile, gently whisk the eggs and yolk together. Set aside. Sift together the flour, baking powder, salt, sugar, and ground tea into the bowl of an electric mixer fitted with a paddle attachment. Mix on low until combined. Add in the butter, vanilla, and infused milk with the mixer on low until the dry ingredients are moistened. Turn mixer to medium-high and mix for about 1 minute until combined. Stop the mixer and scrape down the bowl. Turn the mixer to medium. In two additions, add in the egg mixture, mixing for about 20 seconds before the next addition. Stop the mixer and scrape down the bowl. Do not over mix. Evenly distribute batter between the three cake pans. Bake for about 22-24 minutes, or until done and a toothpick inserted in the center of the cakes comes out clean. Cool on a wire rack 10-15 minutes before removing cakes from their pans. Bring the sugar and water to a boil in a medium saucepan over medium-high heat. Reduce the heat and bring mixture down to a simmer. Add in the tea and continue to reduce the syrup for about 10 minutes. Remove from heat and let steep until cool. Strain out tea and discard. Place the egg whites and sugar in the bowl of an electric mixer. Whisk to combine. Heat a few inches of water in a medium saucepan over medium heat. Place the mixing bowl on top of the saucepan to create a double boiler. Whisking constantly, heat the egg mixture until it reaches about 155 degrees on a candy thermometer, or is hot to the touch. Once hot, transfer the mixing bowl back to the mixer. With the whisk attachment, beat on high until the outside of the mixing bowl returns to room temperature – about 10 minutes – and you have medium-stiff glossy peaks. Stop the mixer and swap out the whisk for the paddle attachment. With the mixer on medium-low, add in the butter and vanilla bean. Mix on medium-high until silky smooth. Add in the syrup and mix until combined. Generously brush the cake layers with any remaining syrup. 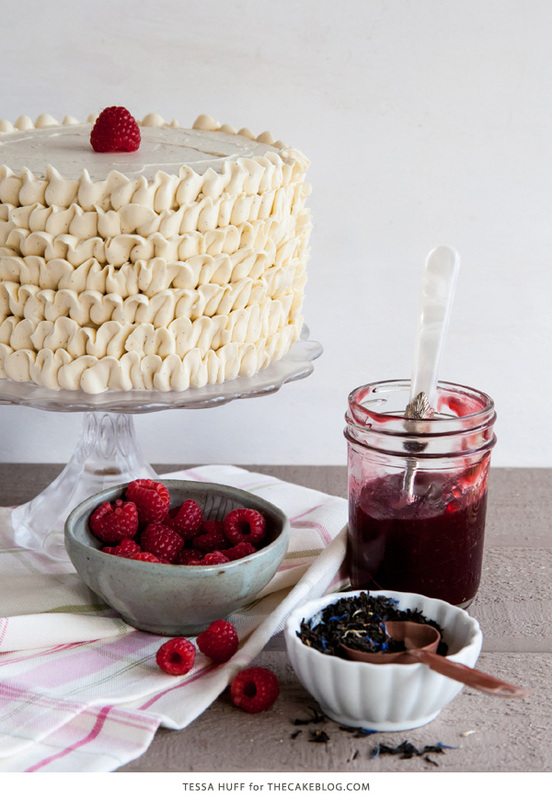 Fill the layers with raspberry preserves and frost with the buttercream. Garnish with fresh raspberries, if desired. And everything looks even better with the ruffles! Silly question but for ground tea, do you just grind the loose leaf tea? Yes, grind the loose leaf tea – a coffee grinder works great for it. In my case, I cheated and ripped open earl gray teabags to use what was in them – it was so finely ground that I didn’t need to throw it in the grinder at all. Awesome can’t wait to try it out, tanks a million for this great recipes love it. I’m curious about this reverse creaming method, where you add the butter to the dry ingredients instead of creaming the butter and sugar (as you do in some of your other recipes). Do you think there’s a benefit to doing it this way, or that there’s much a difference compared to doing it the traditional way? OK, now I have a more serious question. I just added my earl grey tea leaves into my saucepan of barely simmering milk, and the milk curdled instantly. Now I have a saucepan full of tea leaves, water, and milky lumps 🙁 I consulted the internet, and apparently earl grey is well known as a variety of tea that causes milk to boil because of the bergamot content. I wouldn’t know, because I drink my tea black and had always just thrown tea leaves directly into the cake batter rather than this steeping method. I just made this, so I thought I’d let you know how I worked it out just in case you end up making it again! I ended up using tea bags instead of loose leaf tea so that I didn’t have to strain it afterwards. I used double bergamont earl gray tea and had no issue with the milk curdling. What I did was put the cold milk and the tea bags in the saucepan, and very gently (slowly) bring it to a simmer. Mine never reached a boil and it didn’t need to – I let it simmer really low and steep for around 20 minutes and it tasted/smelled amazing. I added an extra 1/2 cup of milk to compensate for what would evaporate, and it worked perfect – I ended up with 1 cup of earl gray milk afterwards. I don’t know it that makes sense, but hopefully it helps! Thank you for that tip! I followed your guidance for the Earl Grey milk and it came out tasting wonderful! This was my first time making a cake of yours and also my first time doing a layered cake. It came out perfect! Mine was a little on the drier side because my milk reduced (my fault)! I bought the tea linked in this recipe from Amazon and had no problems with curdling. I would recommend refrigerating the frosting for a while before applying to the cake because my butter was so mushy after leaving it out overnight that it made piping a disaster. This cake keeps well in the fridge. The cake was absolutely delicious! Earl Grey is my new favourite flavour. The only problem I had with this recipe was the syrup. When it had cooled down enough, the sugar crystallised and I had to reheat it before I could use it for the buttercream. I was afraid the syrup might be too warm and melt the buttercream but fortunately, it worked! Thanks for the wonderful recipe! Can’t wait to try more! I baked two of these cakes yesterday. Most of it was a disaster, for me, but the flavor is incredible. I’m definitely going to try to bake this cake again. I feel in love with this recipe when I found it! We throw a big gin party every end of summer and I like to offer things out of the “norm” for people to enjoy. I made the cake and frosting ahead of time as a sheet cake, wrapped and froze it for a couple of days. The day of the party, after a slight defrost, I used a mini round cutter to punch out one-bite sized layers. Being a bit of a masochist I proceeded to make little layer cakes: tea syrup, raspberry preserves, a swirl of frosting in the middle, layer of cake with a little swirl of frosting and a dap of raspberry on top. Why does this make me a masochist? Because I have Never done anything like this before and here I am doing it for guests! I would not have gotten good marks for presentation on The Great British Bake Off but I was pretty darn pleased with the results and everyone loved them! Thank you for this beautiful cake. Hi! 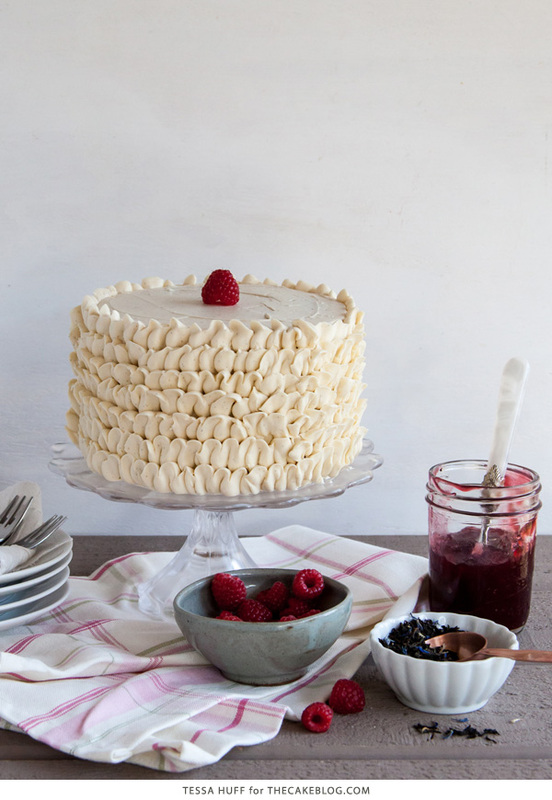 How would you scale this up to 3 8″ cakes instead of 3 6″ cakes? Just multiply everything by .3? Great combination of flavours with with raspberry and earl grey (<— my fave!). Just wondering what tip you used to do your ruffles? This cake was pitiful. Could not taste the Earl Grey at all and the cake layers were H E A V Y. I mean, when this batter was put into the cake pans (and there was no way to get 3 cake pans out of these measurements) it was not pour-able at all. It looked like glue and tasted worse than a box cake mix. We took this to Thanksgiving dinner and, well… no one asked for the recipe. We also had to pour most of the frosting down the drain as those measurements were not right either. I think there should have been more pictures of the process of making of this recipe to go along with the directions rather than so many picture of the finished cake. I dont’ know what the commenter above me is talking about because if you make sure to follow the recipe to a T, there is no way that you won’t end up with a nice fluffy Earl Grey tasting cake. The batter was liquid enough and I could taste the Earl Grey. I almost didn’t want to add the filling just to enjoy the tea flavor on its own! I opted for a lemon curd filling instead of the raspberry and I must say that it was overpowering. I should have gone for the raspberry which is a more subtle flavor. Also, and that is my own preference, I would reduce the amount of sugar in the frosting to maybe 3/4 of a cup. It was just too sweet for me. I used cane sugar by the way. I don’t know if that’s the reason why it was too sweet. That was my first time making a cake from scratch, including the buttercream frosting, and it was a success! I will be making a 3 tier 8″ version of it for a birthday that’s coming up. I made this over the weekend and must side with the previous couple of comments. The cake was HEAVY, DRY and pretty dense, almost like eating cookie cake. The flavor was great, just not enough liquid in the batter to make cake with. No one asked me for the recipe either and I spent all day making this for a friends birthday. Won’t be using this recipe again and will pay closer attention to any other recipes from this blog!! What a beautiful cake. I am sorry to inform you however, that you did not attend a High Tea either; you were at an Afternoon Tea. Americans always think that the little cakes and sandwiches at teatime signal High Tea, but High Tea is supper. More substantial food is served, and a bit later as well. Afternoon Tea is held with small bites as those mentioned, and dainty ones at that. But your cake, again, sounds wonderful. HI Nice recipe. Can’t wait to this recipe a try at home.